With today's technology, I am able to offer Toe Readings from a picture of your feet. How cool is that? 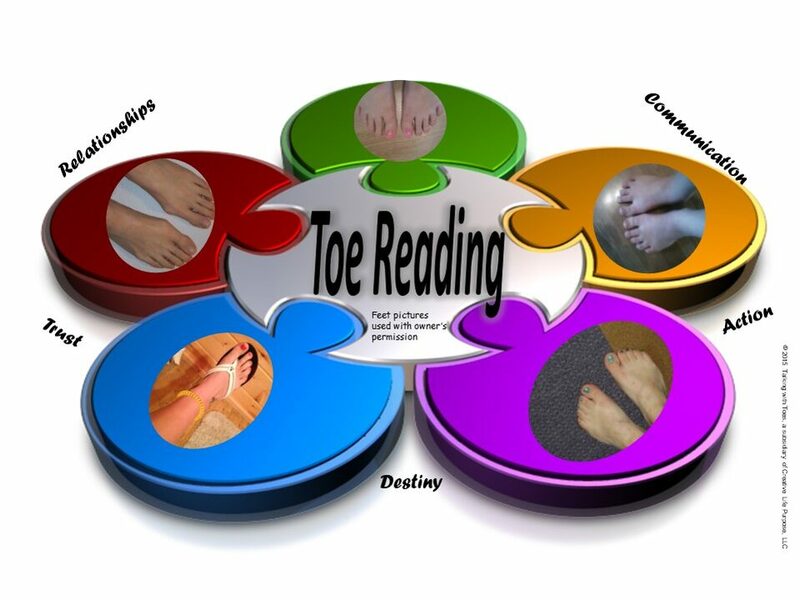 I will do the reading, create your personalized report, and you have two options of how to receive your Toe Reading report once it has been completed: an emailed PDF copy of the report, or a printed copy mailed to you via the postal service. The reports vary in length, anywhere from six pages up to twelve pages, depending upon just how "talkative" your toes are. IF you reside in the Phoenix, AZ area, in-person sessions can be arranged. Contact me to discuss. When you send a photo of your toes to me please be sure to specify how you prefer delivery of your Toe Reading report. If you want it printed and mail to you, then you must provide a real and correct mailing address. If you do not specify delivery method then the completed report will be emailed to you. To make your purchase, click the "BUY NOW" button below. NOTE: Upon purchase, your receipt will show, Creative Life Purpose, LLC, as this is the parent company. IF you reside in the Phoenix, AZ area and would prefer an in-person session, be sure to reach out to me to schedule a time for the session prior to making your purchase. Limited appointment times are available.